Jonathan Nez addresses a crowd after he's sworn in as president of the Navajo Nation on Tuesday, Jan. 15, 2019 in Fort Defiance, Ariz.
Jonathan Nez delivered a message of hope, resilience and change Tuesday in his inaugural address as president of the Navajo Nation, drawing from the tribe's history as a way to move forward. The two easily won November's general election to lead the tribe on the nation's largest Native American reservation for the next four years. They will have to confront a loss of about $40 million in annual revenue and hundreds of jobs held by Navajos if a coal-fired power plant and its supply mine close in December, as expected. Nez and Lizer said they would support Navajo entrepreneurs and Navajo-owned businesses, eliminate redundancies in the tribal government and restore people's trust in their leaders. They also vowed to work with tribal lawmakers. "We have to begin to view the situation as an opportunity to re-evaluate ourselves on the way we do business,'' said Nez, 43. The inauguration was a mix of traditional Navajo elements and Christianity, which wasn't received well among everyone in the audience, with speeches in Navajo and English. A traditional practitioner blessed the men, as did pastors. Nez quoted scripture in his address and highlighted the strength of Navajos who were forcibly marched off their homeland 150 years ago and of Navajo women. His words about instilling hope in Navajo youth facing adversity because of bullying, depression and rates of suicide among Native Americans that are higher than the general population were reassuring for Kathleen Bowman, who heads the tribe's public defender office. John Nez, right, and Mabel Nez, seated to his right, attend the Navajo Nation inauguration on Tuesday, Jan. 15, 2019, in Fort Defiance, Ariz.
Nez proudly proclaimed he's from Shonto, Arizona, and had leaders from the community and his own parents depicted in faint images over pictures of Shonto Canyon displayed behind the stage. Also in the backdrop were two large Navajo rugs woven in the Ganado style, symmetrical geometric designs that look like dazzling eyes in colors that aligned with Nez's campaign. Two rugs featuring the Navajo Nation seal were on either side. "To me, the youth are our future, and the way they're depicting our culture is different, is changing,'' he said. The Navajo Nation Council delegates took the oath of office together, picking items from a basket that's referred to as their medicine bundle in blessing themselves. 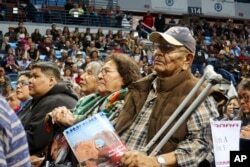 Other leaders of Arizona tribes and past Navajo leaders attended the inauguration. But the Navajo Nation's immediate past president, Russell Begaye, did not. He ran for re-election but didn't make it beyond the tribe's primary in August.